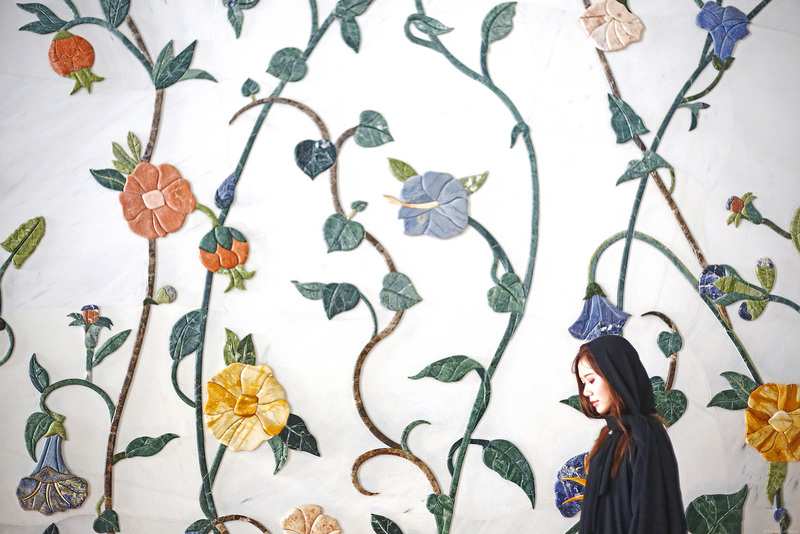 Back to my travel diaries from UAE! 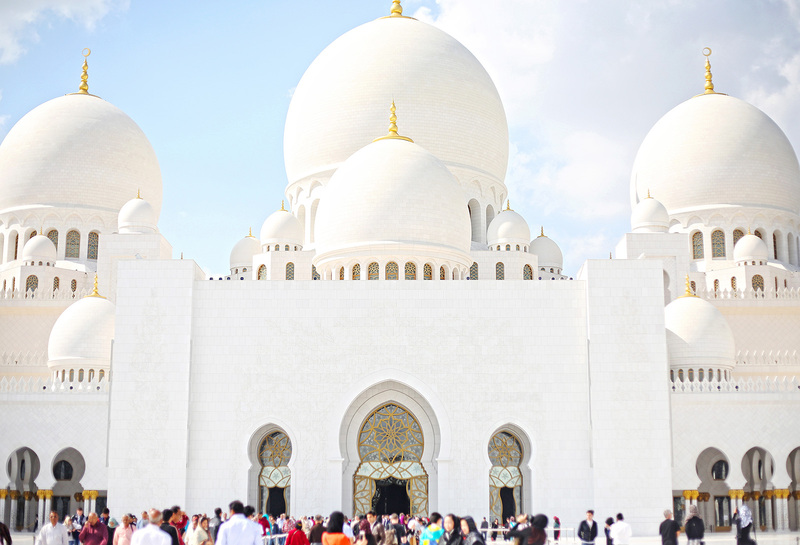 I’ve already shared with you the beautiful places I visited during my day trip to Abu Dhabi–save for Sheikh Zayed Grand Mosque. 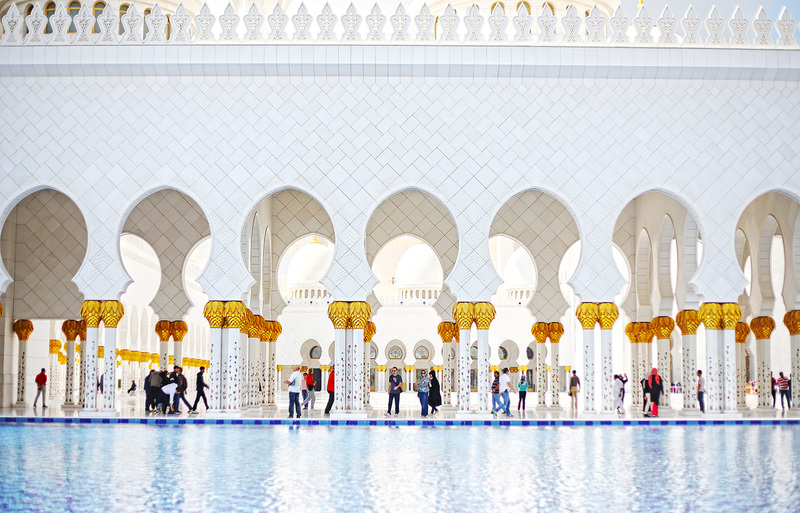 As you browse through my photos below, you’ll understand why this grand mosque deserves a dedicated blog post. 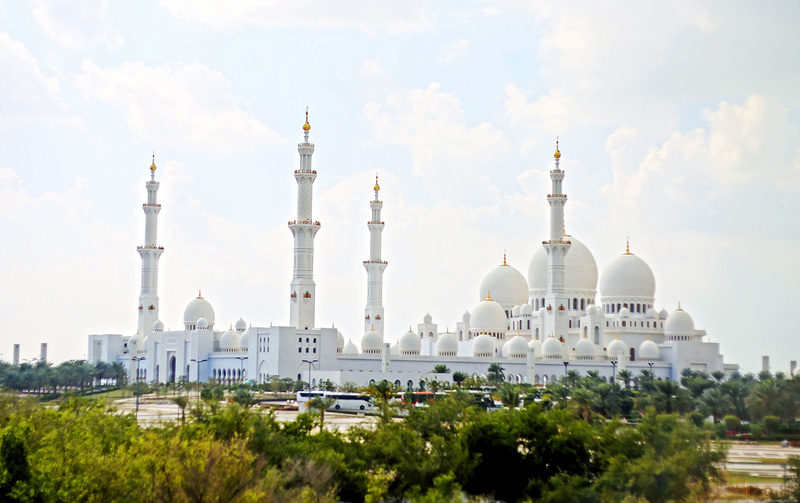 The Sheikh Zayed Grand Mosque is the largest mosque outside of Saudi Arabia, following the ones in Mecca and Madina. 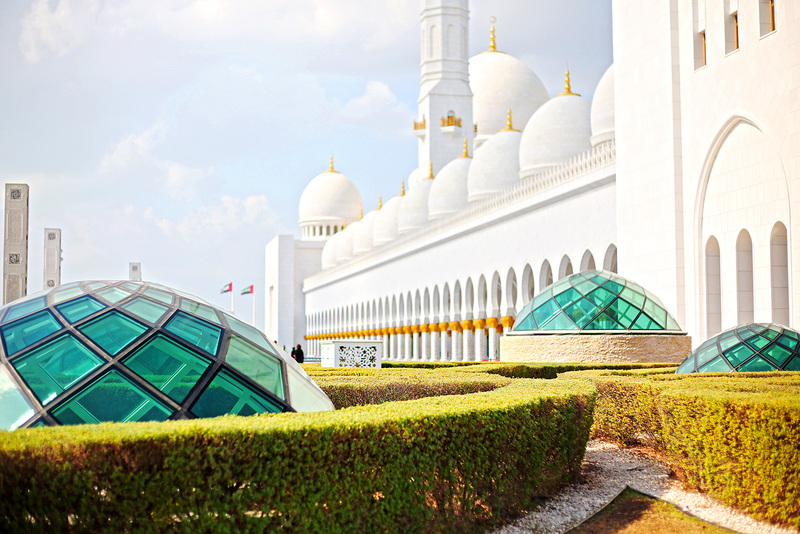 It’s named after the founder and first President of the UAE, the late Sheikh Zayed bin Sultan Al Nahyan. 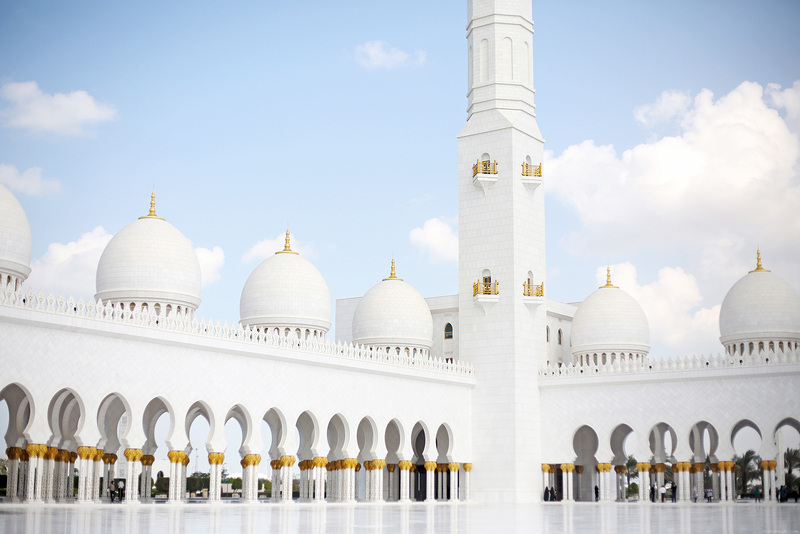 He wanted the mosque to be visible from all directions so he had it built with the rise of 11 meters above sea level and 9.5 meters above street level. All in all, it took almost 12 years and more than 38 contracting companies and 3,500 workers to build this beauty. WOW! 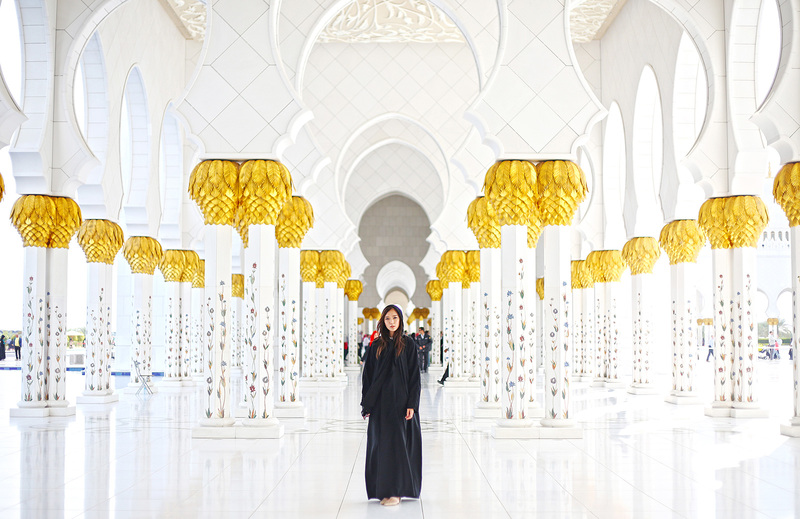 Prior to our tour, I was already told of the Grand Mosque’s dress code–long sleeves and full-length pants or dresses, no shorts. Although I came prepared, our awesome guide Sameh also brought abayas for my mom and I so we wore them as well, just to be sure. Women need to cover their hair too, with either a hoodie or a scarf. I was really conscious about this last bit at first, especially with the wind blowing my scarf out of place all the time. I thought all my hair needed to be covered at all times, without a strand peeking out of my scarf but Sameh told me not to worry. Guards aren’t as strict with tourists as long as you have your scarf on. If you’re wondering if it’s hot wearing an abaya and the scarf, I didn’t feel hot in them at all because (a) it was winter season there and (b) the abaya was in chiffon so it’s pretty light and thin. 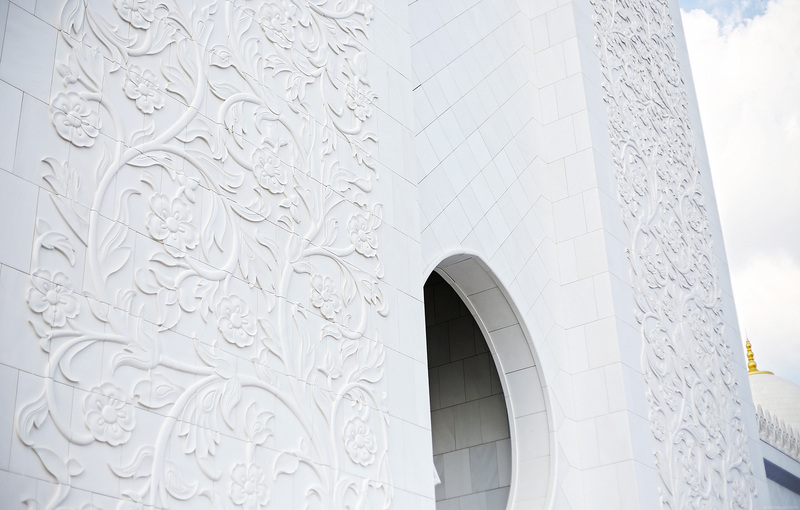 The Grand Mosque is known for its predominantly white color, which the late Sheikh Zayed bin Sultan Al Nahyan was fond of. 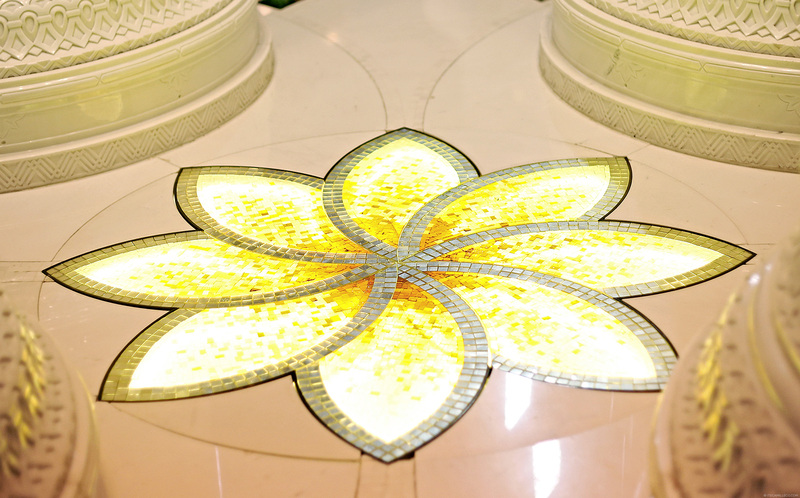 It symbolizes purity and piety. 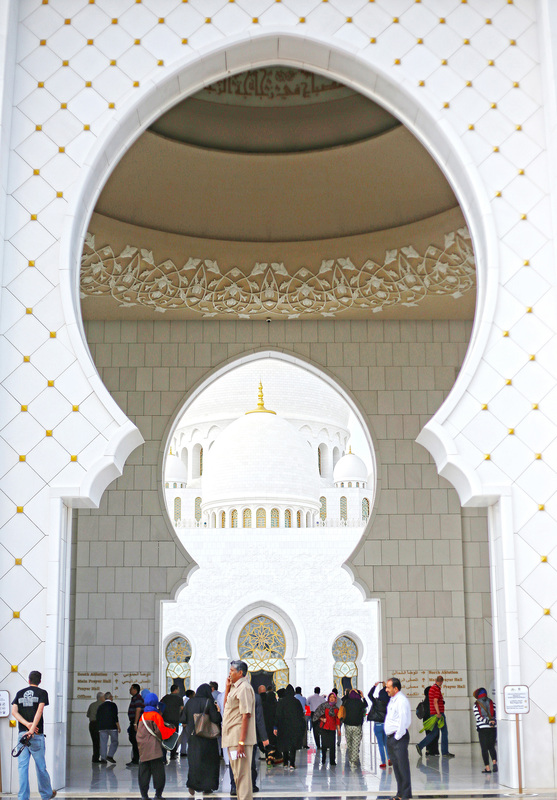 There are 82 domes made of pure white marble cladding in onion shaped crowns and crescent shaped finials decorated with gold glass mosaic at the Grand Mosque. 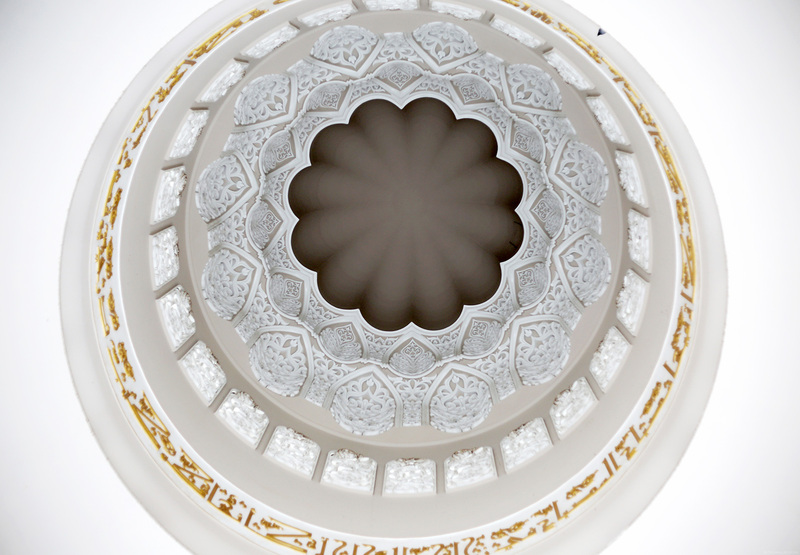 The largest dome is located in the center of the main prayer hall, measuring 85 meters high and 32.8 meters in diameter. 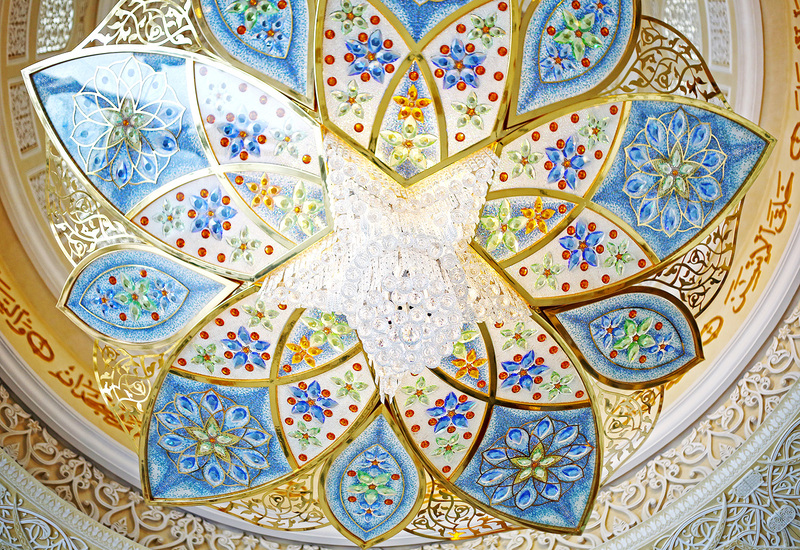 The inside of the domes feature traditional Moroccan artwork with verses from the Holy Quran painted in gold color. Once inside, you’ll see this pretty courtyard that has 1,048 columns. For a minute there, I thought I was in a palace! 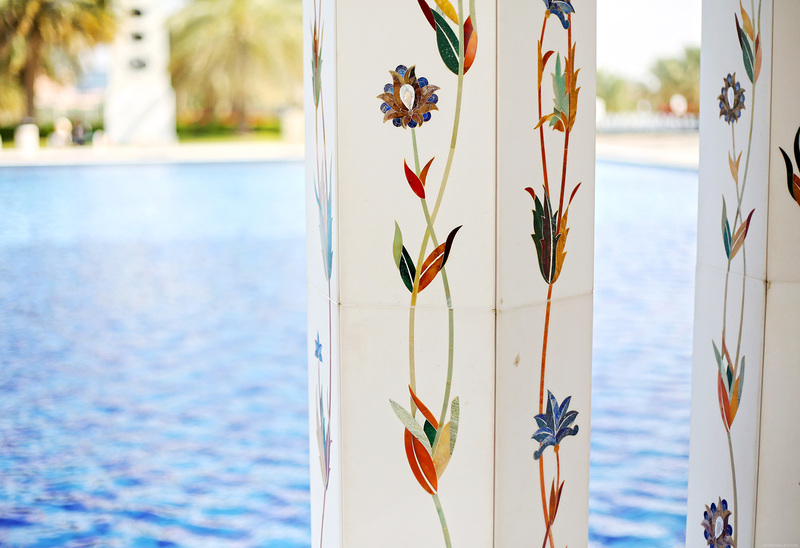 Each column has handpainted flowers on it. 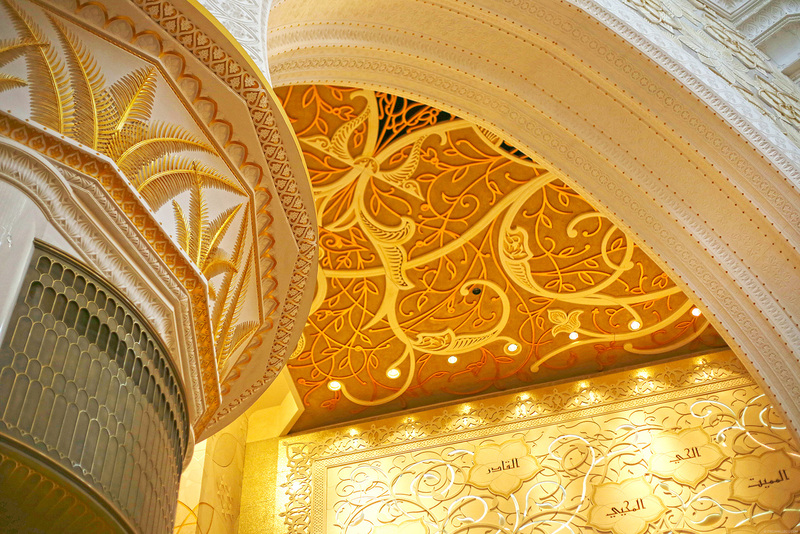 This is the entrance to the main prayer hall. Tourists are required to leave their footwear outside and walk barefoot from this point. 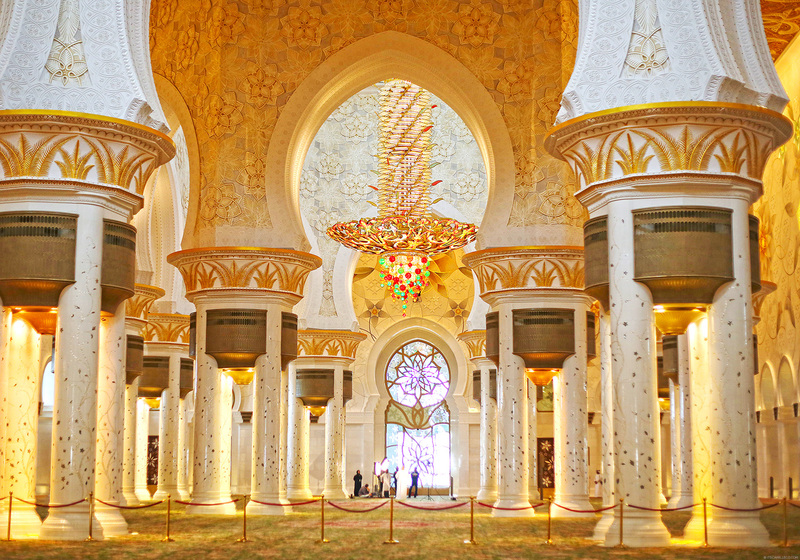 This is how the main prayer hall looks like inside. 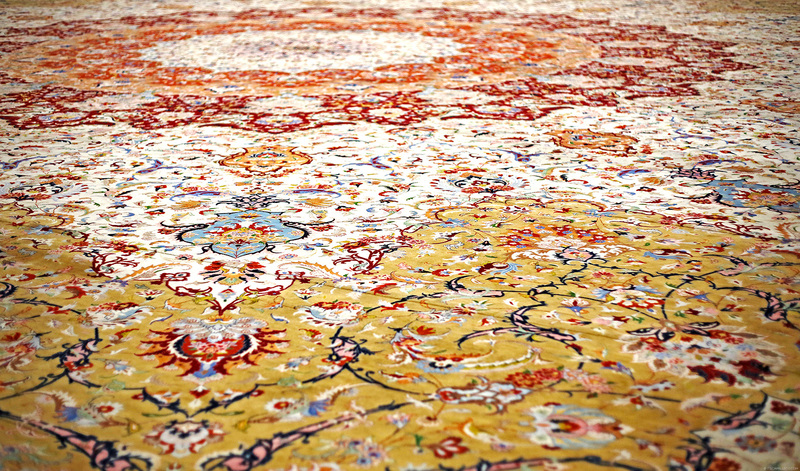 It houses the world’s largest hand-knotted carpet, hand-crafted by approximately 1,200 artisans in Iran. If you look closely at the carpet (closeup photo in one of the photos below), there are horizontal lines which are slightly raised over the primary carpet’s height. 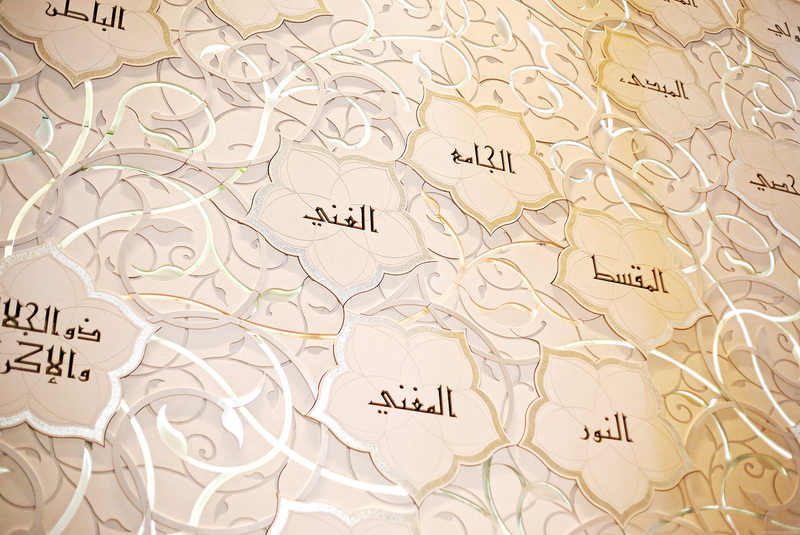 Some tourists mistake them as cuts on the carpet but in fact, these are just to help guide the worshippers’ alignment. 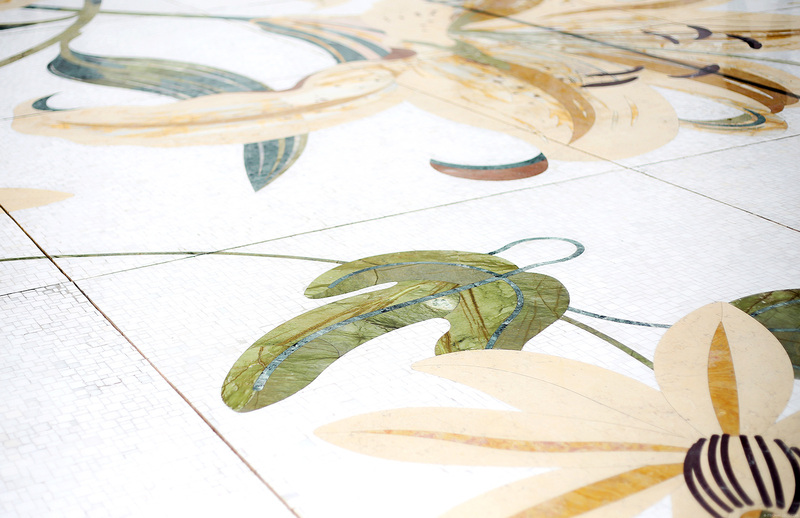 The carpet is still in one-piece, all 5,700 square meters of it. See the lines I was talking about? This is one of the grandest chandeliers I’ve ever seen. 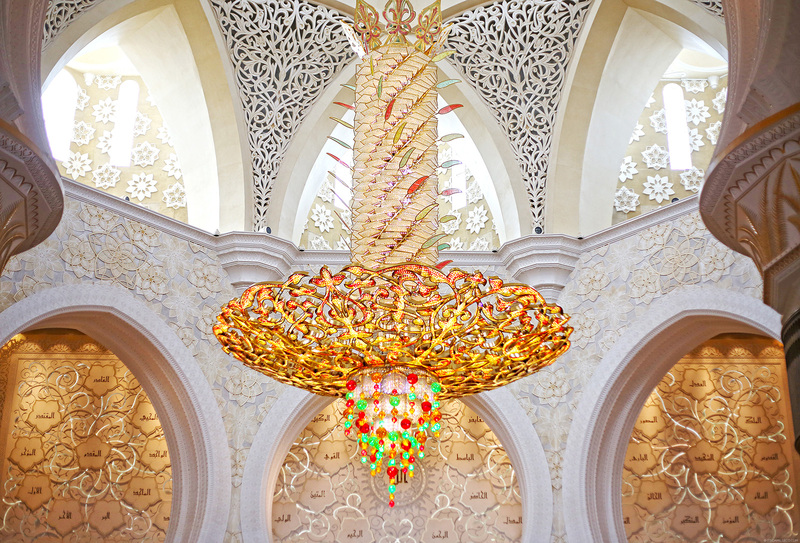 Sheikh Zayed Grand Mosque actually has seven crystal chandeliers situated inside its halls and foyers, all of which were made and shipped from Germany by Faustig. This one is the largest and weights approximately 12 tons! 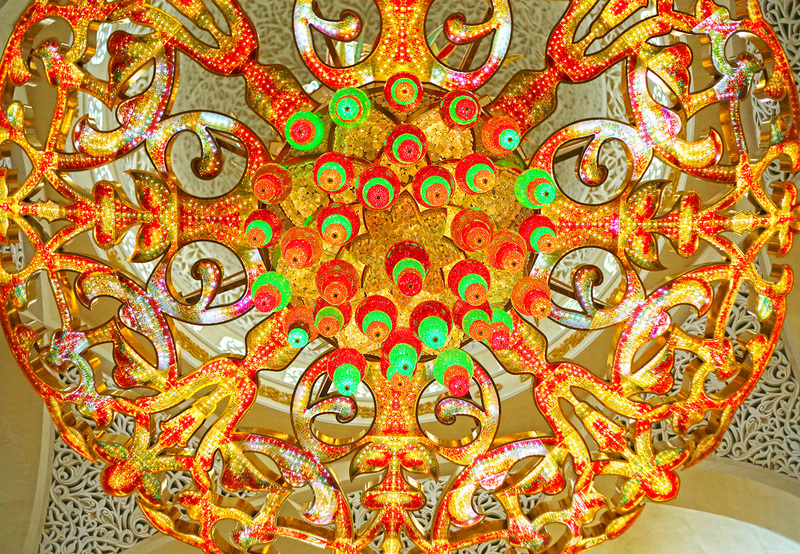 All of the Grand Mosque’s chandeliers are studded with Swarovski crystals on them. I literally ogled for a good 3 minutes. 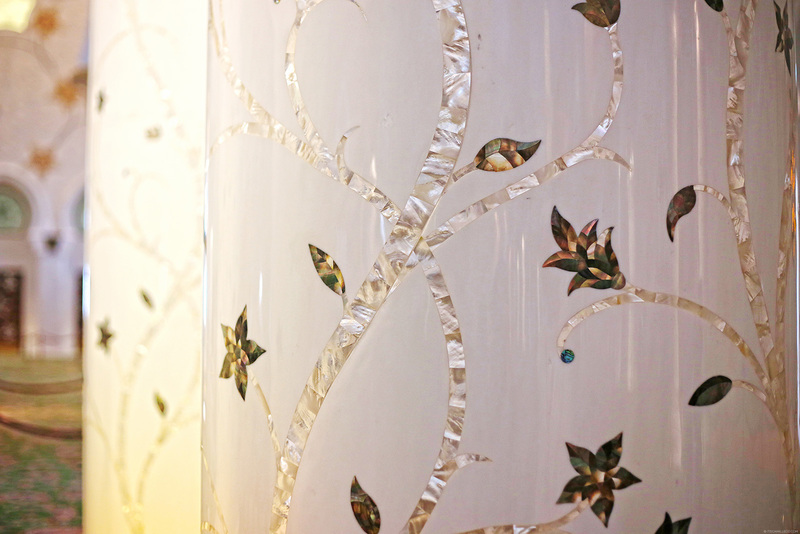 Mother of pearl on the pillars! 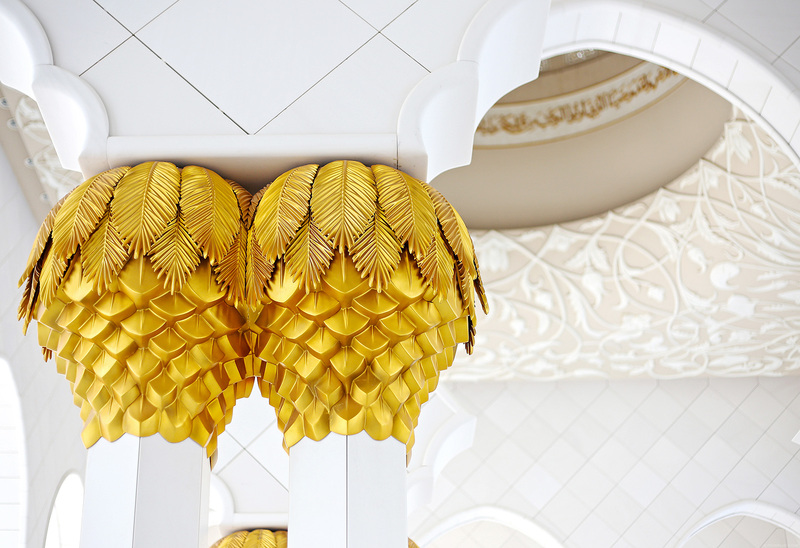 Every corner is adorned with the most intricate details! Our guide told us that the white marbles used here were shipped all the way from Italy and the colored ones are from Spain, Morocco, China and India. 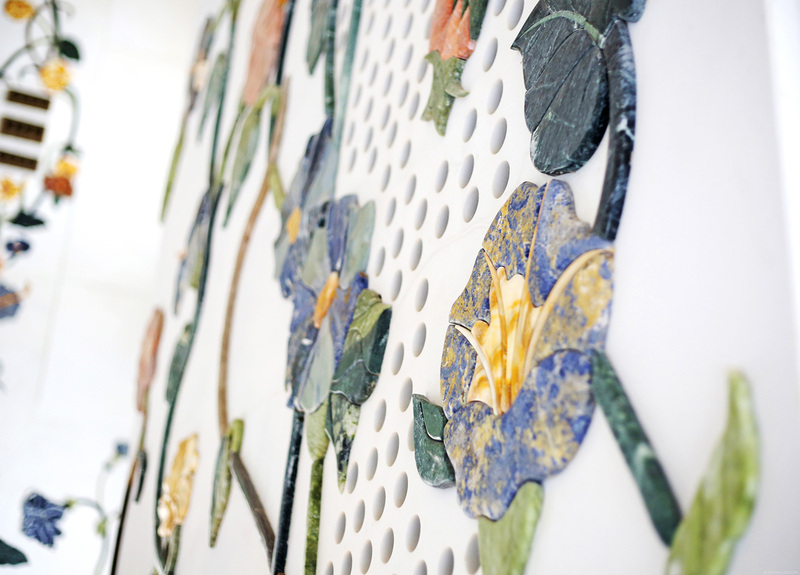 As you can see, there’s no shortage of marble stone, gold, semi-precious stones, crystals and ceramics here. 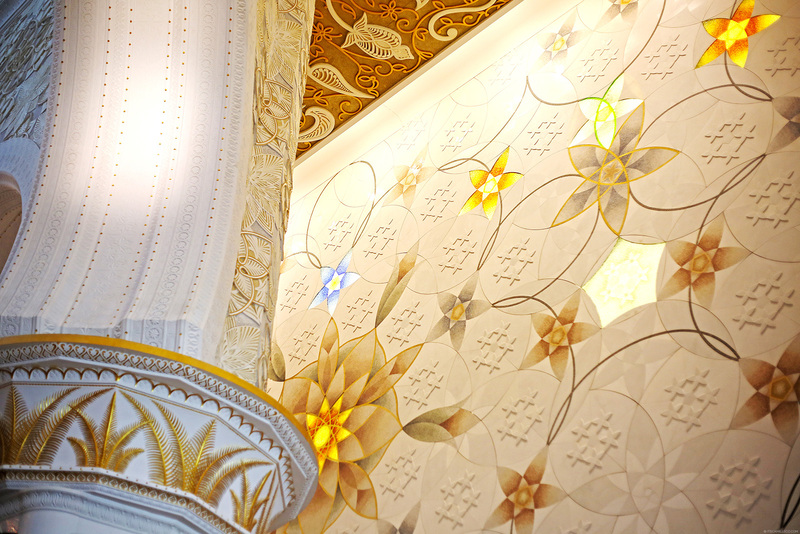 The entire place is a work of art which is why I count this as the highlight of my day tour in Abu Dhabi. Just a little reminder though to those of you who are planning to visit this place, please bear in mind that this is a sacred place of worship. Give respect where respect is due, especially when you’re doing your touristy photos. Certain poses aren’t acceptable. (You’ll see signs posted everywhere to guide you which ones aren’t. Thanks to Rihanna, there’s even a drawing of a person doing her “lying down pose” to prevent visitors from posing the same way.) 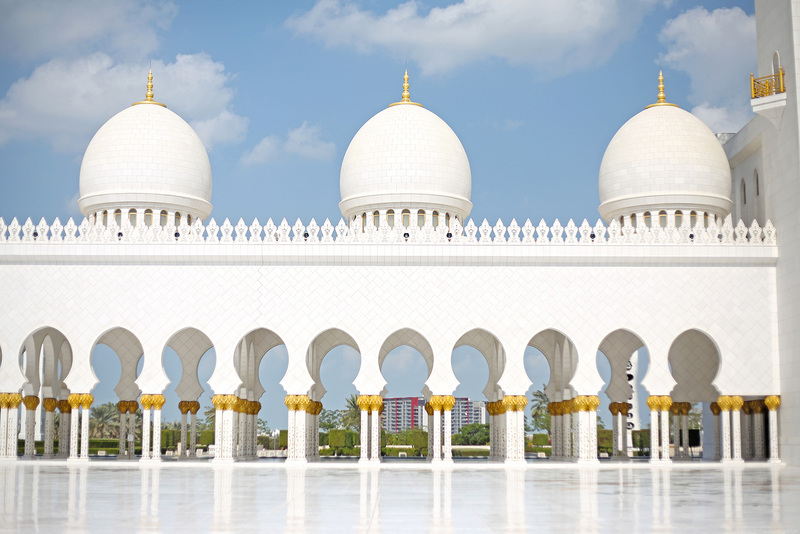 To be safe, do your research before visiting the Sheikh Zayed Grand Mosque. You don’t want to offend anyone. A smart tourist should always be wary of that. Wow! what a view! what camera did you use? Thanks Clariss! I really loved touring around this place. What an experience! One word- WOW… This is an incredible place! Nakakaloka haha! Thank you Kalet! That’s so nice to hear! I know not everyone reads the text I post with my photos so it’s a treat to know there’s at least one who does and even enjoys doing so! :) Thanks Syang! Miss Camille, Thank you for your travel diaries. Wow! This place is on my bucket list already. Thank you for sharing such beautiful places/posts. You will always be the versatille camille that I knew. Stay gorgeous and a dose of good vibes for you! Keep safe and love lots! 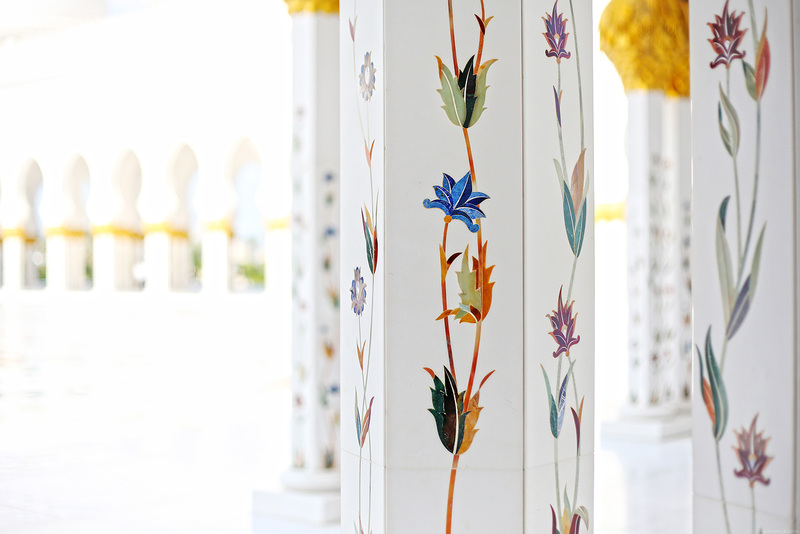 To say that the mosque is majestic would be an understatement. Wow. The details and the colors are just so magnificently put together Cams. This post is such a treat! Thanks Anne! Glad you like it! Still looking good even in abaya! Random question! How tall are you?